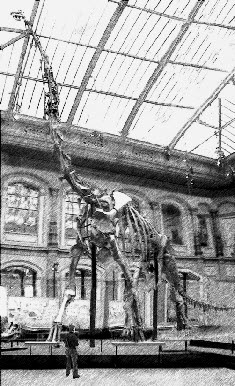 The animal most people recognisable as Brachiosaurus is based on the Brachiosaurus brancai skeleton reconstructed in the Berlin Natural History Museum. It has recently been suggested that this skeleton be reclassified as Giraffatitan brancai but I have continued to use the original classification since the Berlin Museum still calls it a Brachiosaurus. Brachiosaurus brancai appears to have been a gigantic giraffe-like animal, browsing the tops of trees. It is estimated to have a mass about 50 tonnes - as much as 8 bull elephants - although there are widely different estimates of its weight. The shape of its deep, narrow chest and its legs suggest an animal that lived on land. The specimen of Brachiosaurus displayed at the Berlin Natural History Museum is the tallest mounted dinosaur skeleton in the world. The skeleton was discovered in 1912 at Tendaguru in Tanzania and shipped to the Berlin museum for display. In the picture opposite I can be seen at the front to illustrate the enormous size of this fabulous creature. The skeleton is so large that if I had been allowed to walk under it I don't think I could reach its ribs. a high pressure would rupture its heart. This problem of high blood pressure would not exist on a Reduced Gravity Earth because blood pressure is lower in a reduced gravity. Various methods of dynamic similarity, leg stress and blood pressure can be used to estimate gravity as about half the present gravity when Brachiosaurus brancai lived. Taylor, Michael P. 2009. A re-evaluation of Brachiosaurus altithorax Riggs 1903 (Dinosauria, Sauropoda) and its generic separation from Giraffatitan brancai (Janensch 1914). Journal of Vertebrae Paleontology 29(3):787-806. Pdf link here. Dr. Michael P. Taylor Palaeontology Publications here.